I’ve just gotten back from a nice week off of school, though I didn’t do much other than work on my upcomming site. I want to try to post at least once a week(every monday), but I hope to post twice a week once I start getting back into my usual schedule(vacation changed things around). Anyway, I thought I’d post about my cradle I use to program my attiny2313’s, in case anyone reading(no one yet) this blog is interested in getting into AVR. I found the guide on instructables(link), however I printed the PCB too small, and I didn’t have easy access to a laser printer(needed for making PCB’s), so I had to use some protoboard and jumper wires. It doesn’t look the greatest, and I’m sure it’ll break soon, but at least it works, and I can plug it into the breadboard to program and de-bug at the sme time. ~ by emudeath on February 23, 2009. That is really cool looking. I’ll have a try at making one myself. 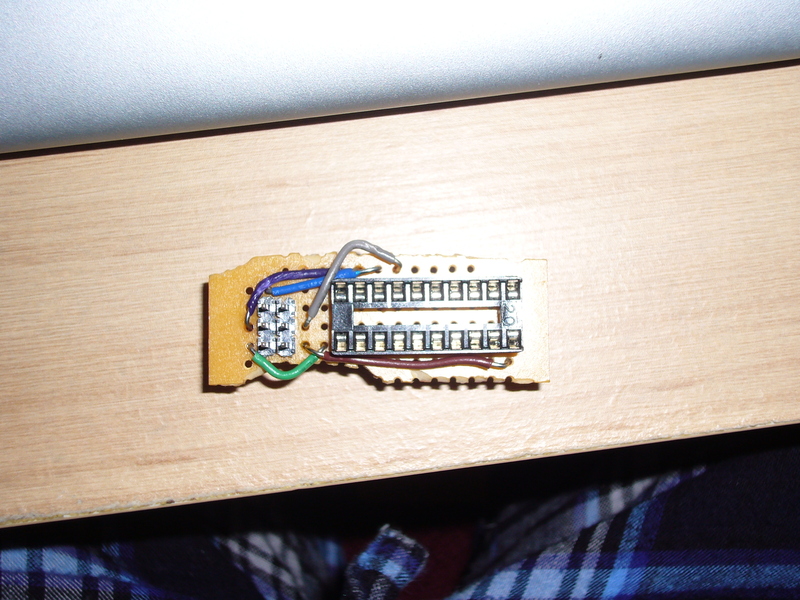 I had an atmega168 laying around somewhere… maybe I’ll make one for that.